At the Alzheimer’s Disease Association, we run multiple centres and programmes including the New Horizon Centres, Family of Wisdom Centres, Support for Caregivers, Volunteer programmes and other public education work. If you would like to support us, direct donations are welcomed. The proceeds will be used to help fund our centres and programmes, as well as help start new programmes that will benefit people with dementia and their families. Donations by credit card or internet banking can be done through Giving.sg (for ONE-TIME or MONTHLY donations) or through GiveAsia. For donations by cheque, please issue a crossed cheque made payable to “Alzheimer’s Disease Association” and send it to the address below. You may wish to send us the cheque by post or by hand to our address at 70 Bendemeer Road, #06-02 Luzerne Building, Singapore 339940 (Tel: 6293 9971). You can donate through PayNow on your i-Banking application, click here for more details. Please include your NRIC number and name to be eligible for 250% tax-deduction. Do note that we will not be able to issue official receipt for donation made via PayNow. At ADA, we rely heavily on the generous contributions of the public to further our cause. Apart from important gifts of time and money, donations in kind (DIK) are helpful and very much welcomed. If you would like to fulfill any of the items on our Wish List, please email donation@alz.org.sg or alicewong@alz.org.sg. Alternatively you may call 6389 5103 to find out more. We’re also recruiting Guardians of Memory! Learn more about our recurring gift programme below or click to give! Thank you for supporting the work of the Alzheimer’s Disease Association. A receipt will be issued for your donation and is for your retention only. Your donation will be tax deductible and the deduction will be automatically included in your tax assessment if you have provided us your Name and Tax Reference number (e.g. NRIC/FIN/UEN). Kindly note that you do not need to claim the deduction in your tax form. We are thankful for your generous donations that will be used to fund our centres, programmes and services to improve and benefit the lives of persons with dementia and their family caregivers. Please find the list of donors who have donated $1,000 and above. As a gesture of appreciation and recognition to donors, ADA may publish the names of individual and corporate donors and contributors in our Annual Report. Only the donor’s name or corporate name is published. 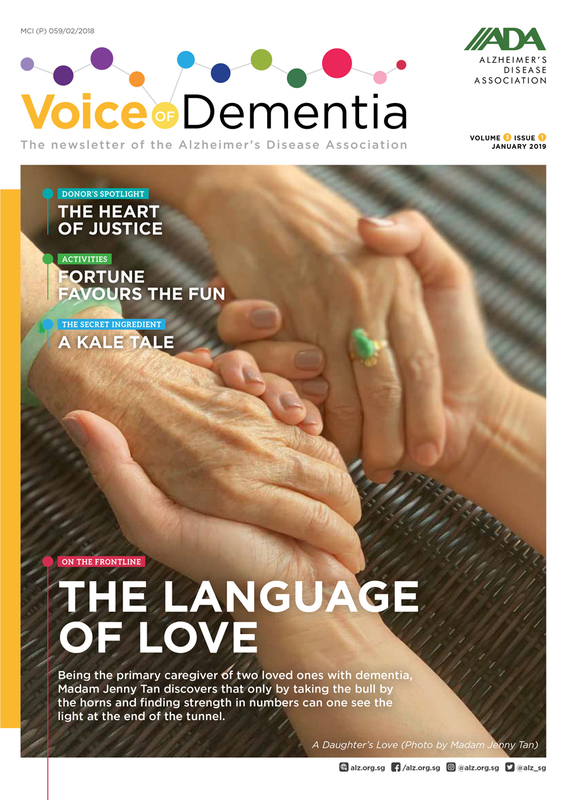 If you or your organisation do not wish to be acknowledged in ADA’s marketing & publicity collaterals, or if you do not wish to be placed on our donor mailing list, please email donation@alz.org.sg. Thank you for your support.